Analysts continue to misjudge the potential threat posed by the Islamic State’s contingent in Afghanistan. They shouldn’t. Sardar Daud Khan Hospital in Afghanistan’s capital city, Kabul, was attacked on March 8 by a bold and complex operation. Men dressed as medics detonated explosives to open the hospital’s main gate and proceeded to open fire on unarmed civilians and medical personnel. 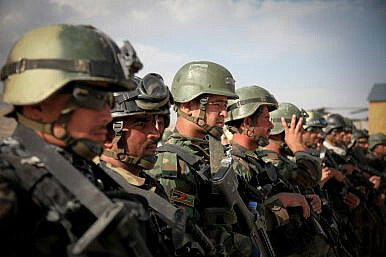 The attackers were killed in the hospital after a lengthy battle with Afghan security forces. Another attack occurred in Kabul a few days later on March 13, when a vehicle filled with explosives rammed a minibus and exploded. This was the fourth major attack in Kabul this month, which usually only sees one major attack per month. The Afghan Taliban have denied any involvement in the Sardar Daud Khan Hospital attack. In recent months, the group has taken a more moderate line (relatively speaking). They have even promised to not attack infrastructure projects in the country. The Islamic State’s Khorasan Province (ISKP) has claimed credit for the attack and, if verified, it would be one more attack in a series of events that indicate a changing strategic landscape in Afghanistan. Many have discounted the potential impact of ISKP, the Islamic State affiliate in Afghanistan. They’ve struggled to extend control outside of Nangarhar Province, their unique brand of extremism is not well received by the Afghan population, and the Taliban continue to dominate in terms of number of attacks, number of deaths, and territory held. However, the emergence of ISKP represents the first time since 2001 that an anti-government movement has existed in the country that competes with, rather than complements, the Taliban movement. These two organizations will compete for recruits, resources, and prestige; and in the process, they will increase the violence and instability in the region, even if the Taliban remain the dominant insurgent group. As the chart below shows, the opposition to the international statebuilding operation in Afghanistan has been dominated by the Taliban since the U.S. invasion in 2001. Approximately 40 known terrorist and insurgency organizations have operated in the country throughout the statebuilding operation. However, other than the Taliban, only the Haqqani Network and Hizb-i-Islami have had any marginal and sustained significance — that is, until the establishment of ISKP in 2015. ISKP was responsible for 56 casualties the first year it was officially announced as an ISIS affiliate in early 2015. In that first year, it became more significant than any other non-Taliban group in the country. 2016 saw a series of high profile attacks, including an attack on a funeral in Kabul that killed 80 and another attack outside Afghanistan’s Supreme Court that killed 22. 2017 has continued this trend, even with commentators and analysts continuing to focus on ISKP’s inability to gain territory as an indication of their insignificance. This is a result of comparing ISKP to its parent organization, which is an anomaly in the world of terrorism. Most terrorist organizations are small in number, last a short period of time, and never hold territory. Therefore, ISKP’s threat potential is being based on an unreasonably high standard. 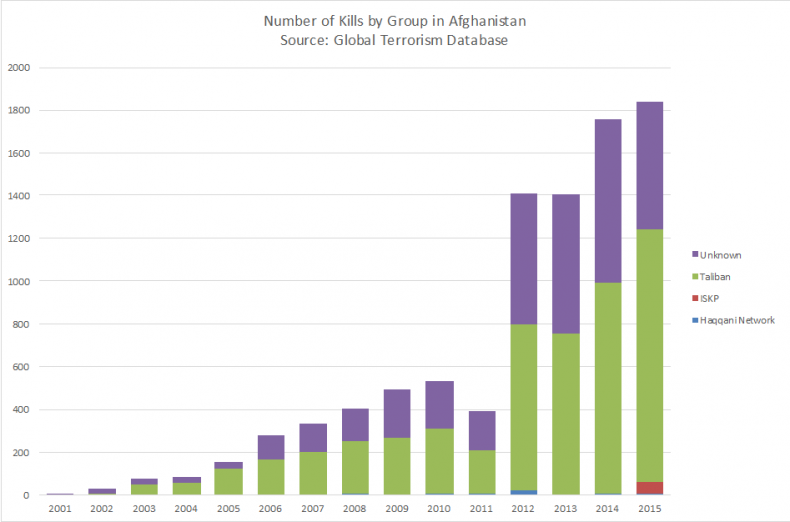 Some have noted the vast difference in number of attacks, and the lethality of attacks, as evidence for the claim that the Taliban remain the primary threat in Afghanistan. However, this is an answer to the wrong question. Rather than asking which group poses the biggest threat, we should be asking what it means that a rival to the Taliban are becoming increasingly effective. What does this increasingly complex battlefield mean for the central Afghan government, as well as the international community that has a stake in the outcome? When two organizations exist in the same space, fighting for the same cause and competing for the same pool of potential recruits, they will engage in outbidding. They will attempt to one-up each other to show that they are the true vanguard of the cause, that they are more important, and to try to attract more recruits and resources. This occurred on an international level when the Islamic State swept into prominence in 2014. Their bold successes and brutality attracted prestige within the jihadist movement and diverted recruits away from al-Qaeda. This process will not only lead to more violence, but will most likely push each organization to increase the brutality and scale of their attacks as they compete with each other. Mia Bloom, a terrorism scholar, when discussing increasing violence in the Palestinian territories said, “Multiple organizations are engaged in this competition and use violence to increase their prestige.” This argument is used to explain changes in the Israeli-Palestinian conflict when Fatah adopted the use of suicide bombing when it had historically avoided this tactic. Fatah was pushed into competition with other groups claiming to fight for the same cause, especially Hamas. It is argued that Fatah felt compelled to adopt strategies that it saw as helpful for Hamas in recruiting fighters. This is especially concerning considering the fact that the Taliban have taken a relatively more conciliatory tone in recent months and that ISKP is pledging allegiance to an organization known for its barbarity. Are these organizations actually competitors, or are they complementary movements that will coordinate their attacks? The world’s misunderstanding of ISKP is apparent when they question whether these two organizations will be competitors. ISKP came into existence as a result of disillusioned Taliban fighters defecting and forming their own group. Some have questioned ISKP’s ability to carry out the hospital attack because of the complexity and difficulty. However, ISKP members are former Taliban members with knowledge, connections, and a ready supply of examples to follow (the Taliban attacked the same hospital in 2013). They are similar in that they are two groups that focus on the “near enemy” and preference the gaining of territory at the expense of the central Afghan government. It is therefore a zero-sum game between them; if one holds a province the other cannot. Another argument presented to diminish the perceived threat posed by ISKP is to say that their ideology is not well received by the Afghans and that their attempts to expand out of Nangarhar Province in eastern Afghanistan have been rebuffed. These are true, but missing the point. ISKP poses a threat even if they don’t hold territory. Being confined to holding territory in Nangarhar Province hasn’t kept them from launching deadly attacks in Kabul, and it doesn’t stop them from competing with the Taliban. Terrorist organizations can pose substantial threats even if they are not the biggest or the deadliest. ISKP’s emergence on the Afghan battlefield presents a significant strategic problem for the Afghan central government and its international partners that wish to see a stable and prosperous Afghanistan in the near future. Competition in this increasingly complex environment will only serve to worsen the peacemaking process. Even if that Taliban leadership were to agree to a peace settlement and were capable of enforcing it among their increasingly disaffected members, authorities now need to consider ISKP’s position in the country. Civil wars with multiple and fractionalized oppositions are more likely to end later, rather than sooner. Analysts shouldn’t get caught in the trap of saying ISKP doesn’t matter because they don’t want them to matter.